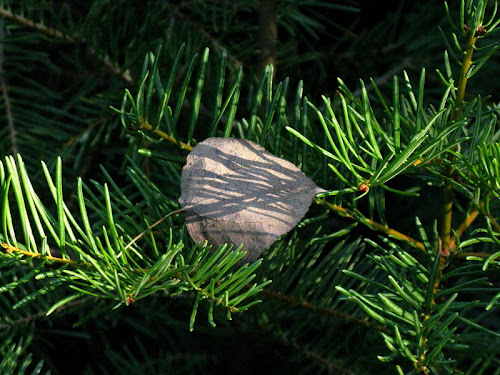 This month's Accretionary Wedge, being hosted by Ron Schott at his Geology Home Companion Blog, is all about the Most Memorable/ Significant Geologic Event That You’ve Directly Experienced. For myself, it often seems as though I'm on the spot shortly after significant events, rather than during them, which isn't entirely a bad thing. 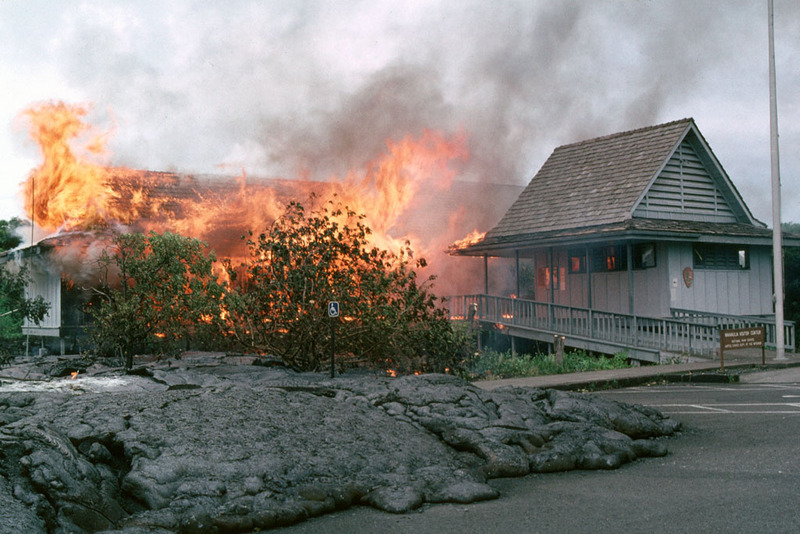 One ongoing event that I did witness in part is the eruption of Pu‘u ‘Ō‘ō. Pu‘u ‘Ō‘ō is the active vent in the East Rift Zone of Hawai‘i's Kilauea volcano. 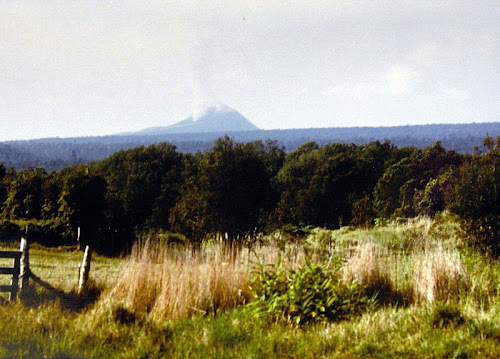 Pu‘u ‘Ō‘ō in May, 1987. 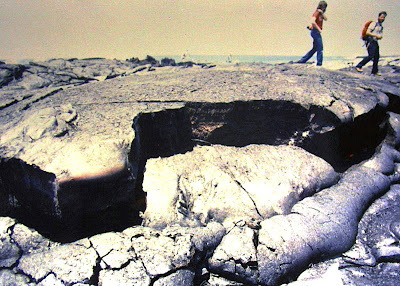 In late May, 1987, I attended the Cordilleran Section meeting of the GSA, which was in Hilo on the Big Island of Hawai‘i during one of Pu‘u ‘Ō‘ō's many eruptions (Episode 48, which lasted from 1986 through 1992 and consisted mostly of lava flows from a new vent, Kūpaianaha, although I don't remember hearing that name in 1987). 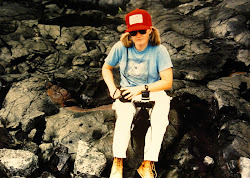 A young geologist with bright red Lang Drilling hat and Nikon camera sits on a 1972 pahoehoe flow that cascaded over the Holei Pali (pali = cliff). The timing of the GSA meeting in Hilo wasn't bad, although maybe it wasn't perfect, and the volcano-oriented field trip I went on before or after the meeting took us down the Chain of Craters road to the Waha‘ula Visitor Center (USGS TNM 2.0 Viewer location of the Visitor Center near Kupapau Point, showing an old topo map). 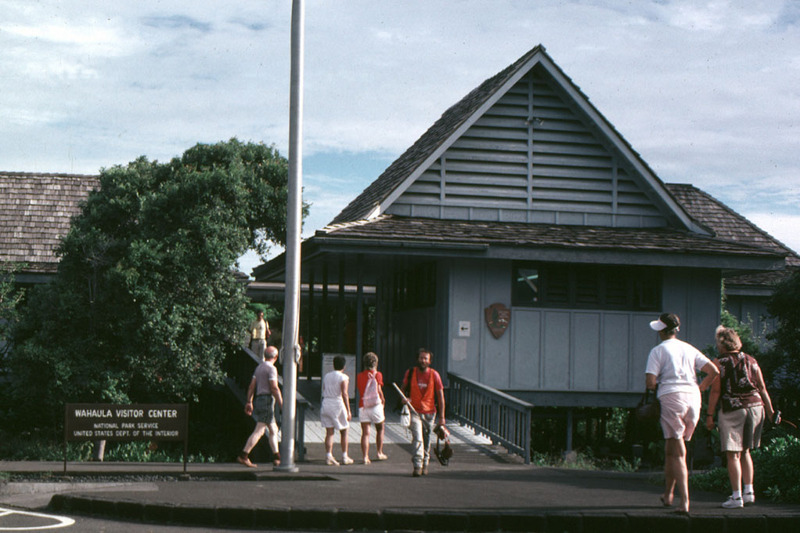 The Visitor Center was later destroyed by a 1989 flow (before, during, and after photos). We arrived on the scene in time to see a scene similar to this one from a slightly earlier field trip: the Chain of Craters road blocked just east of the then extant Visitor Center by what was for us a week-old lava flow. This is the week-old pahoehoe flow, which flowed southeastward from its vent at Kūpaianaha, ultimately making it into the ocean. 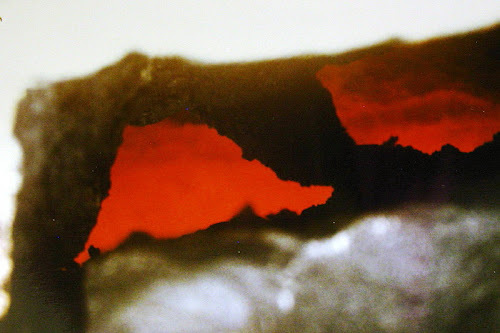 The lava was still hot, although not molten at the surface. We had been cautioned to bring boots with Vibram® soles. A couple orange hot spots can be seen in the original print of this photo (notably in the dark shadow between the two geologists on the flow, click to enlarge). We were the only ones allowed out on the flow that day, and our trip leaders guided us carefully around (and away from) thinner and more dangerous spots, places that were thought to be more likely to collapse. Flow activity in the area had begun about six months prior to our visit; even the 6-month-old part of the flow radiated heat and was warm to the touch. 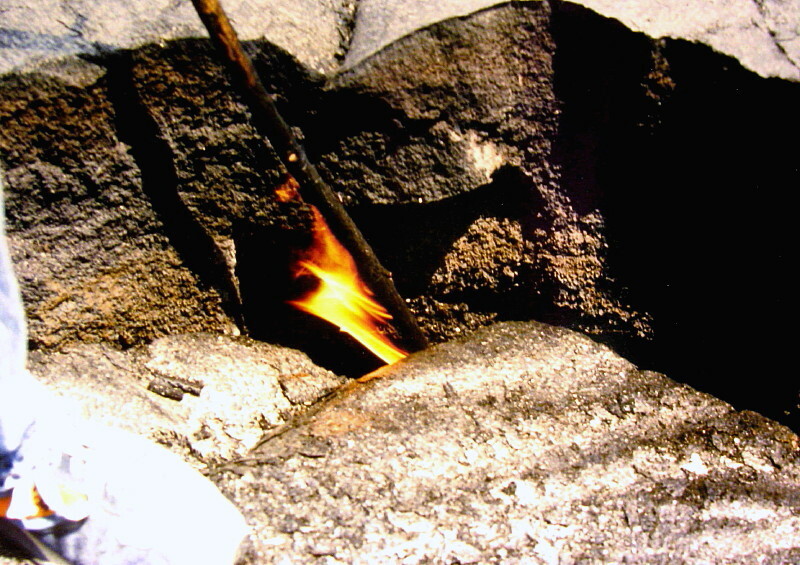 Here, a geologist stands next to one of the open cracks while a stick stuck just below the surface bursts into flames. My best closeup of hot lava only three feet below the flow surface we were walking on. In the distance, steam is rising from the week-old lava flow where ocean waves are hitting the flow. Black sand beaches had already started forming along part of the six-month-old flow. The land surface had been extended oceanward by the flows; we were told that all new land belongs to the state of Hawai‘i. Several of these flows, along with earlier flows of 1983 through 1985 (eruption Episodes 1 through 47, I think), destroyed houses in the area and blocked the road toward Kalapana. Housing and subdivision destruction continued with later parts of Episode 48 (1986-1992) and with even later eruptions. While we were there, some people were still hopeful that roads would be rebuilt. Roads can be built on new flows after about 1 to 1.5 years. The flows we saw that year are shown here in black, lumped with all the Episode 48 flows erupted from the Kūpaianaha vent (map from Heliker et al, 1998, detailed version here). 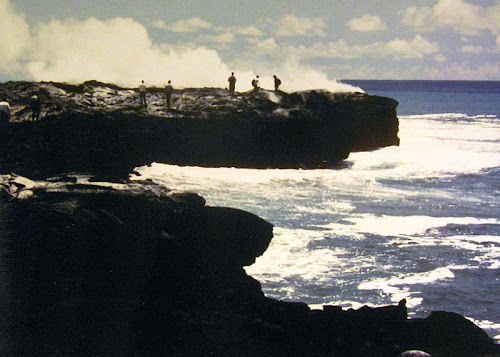 In 1987, the flows weren't as extensive as shown here, especially on the west side where the Waha‘ula Visitor Center was still intact. We were quite excited about walking on the flow, and sometime after the field trip a few other geologists and I went around to the eastern side of the flow where a tongue of lava was coming down the hill from above. A couple people ran up to the flowing lava to take a close look. I think we were about a hundred yards below the molten rock, and I kept wondering if unknown lava tubes would unexpectedly spurt lava out closer to us, but nothing quite that exciting happened (thankfully, in my view). 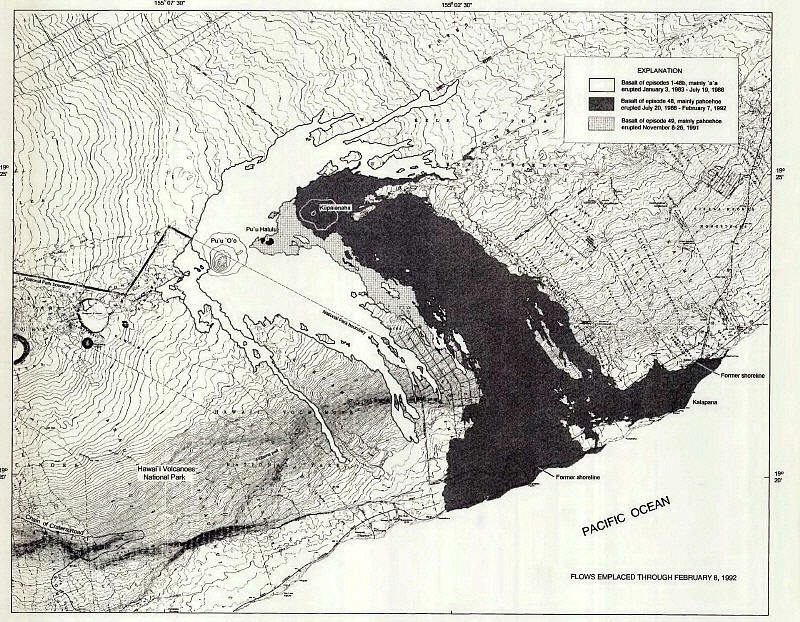 Summary of Pu‘u ‘Ō‘ō–Kupaianaha Eruption, 1983 to present at HVO. Heliker, C.C., Mangan, M.T., Mattox, T.N., and Kauahikaua, J.P., 1998, The Pu‘u ‘Ō‘ō - Kūpaianaha Eruption of Kīlauea, November 1991–February 1994: Field Data and Flow Maps: U.S. Geological Survey Open-File Report 98-103 Version 1.1. 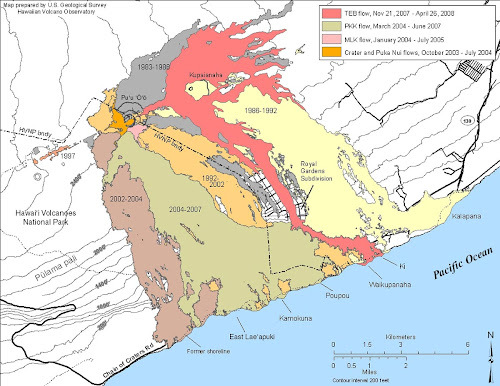 Heliker, Christina, Swanson, D.A., and Takahashi, T.J., 2003, editors, The Pu‘u ‘Ō‘ō-Kūpaianaha Eruption of Kīlauea Volcano, Hawai‘i: The First 20 Years: U.S. Geological Survey Professional Paper 1676. 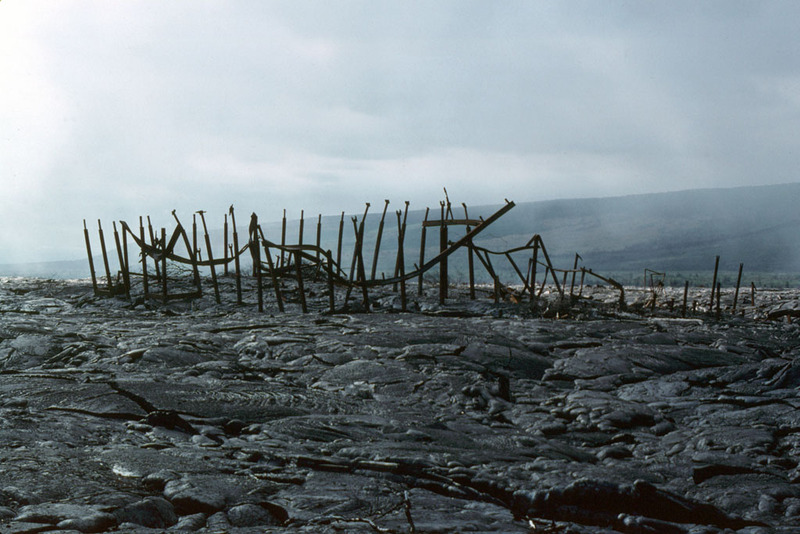 Takahashi, T.J., Abston, C.C., and Heliker, Christina, 1995, Images of Kilauea East Rift Zone Eruption, 1983-1993: U.S. Geological Survey Digital Data Series DDS-24. Map of flows from Pu‘u ‘Ō‘ō: April 30, 2008. 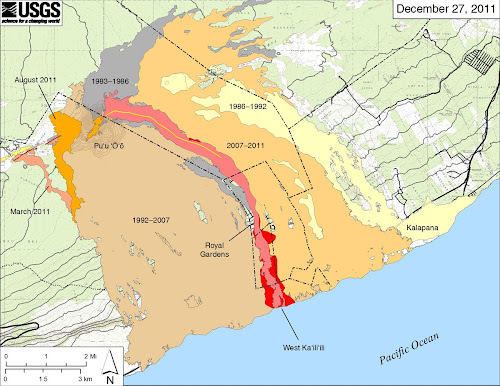 Kīlauea East Rift Zone Eruption Map: December 27, 2011. UPDATE: List of AW#41 participants. Updated 2Jun2016, minor link revision. 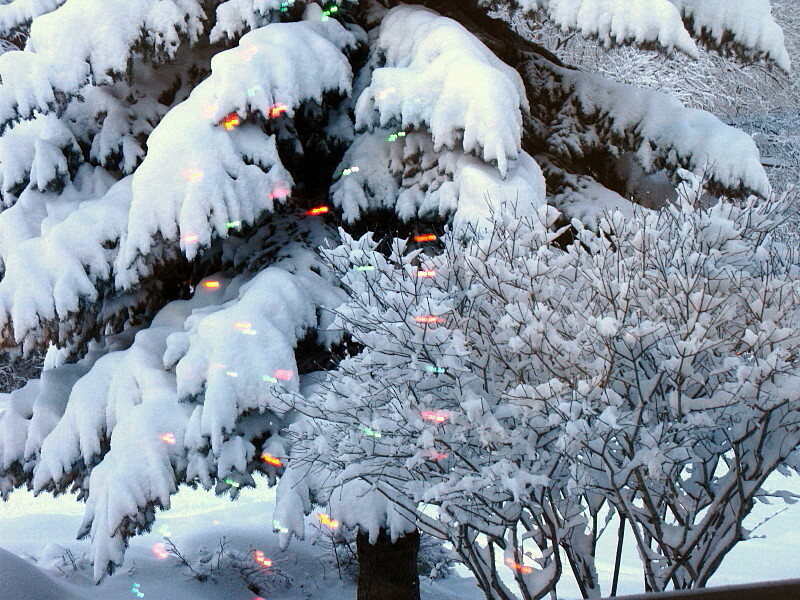 Right now it's 27 inches and counting. 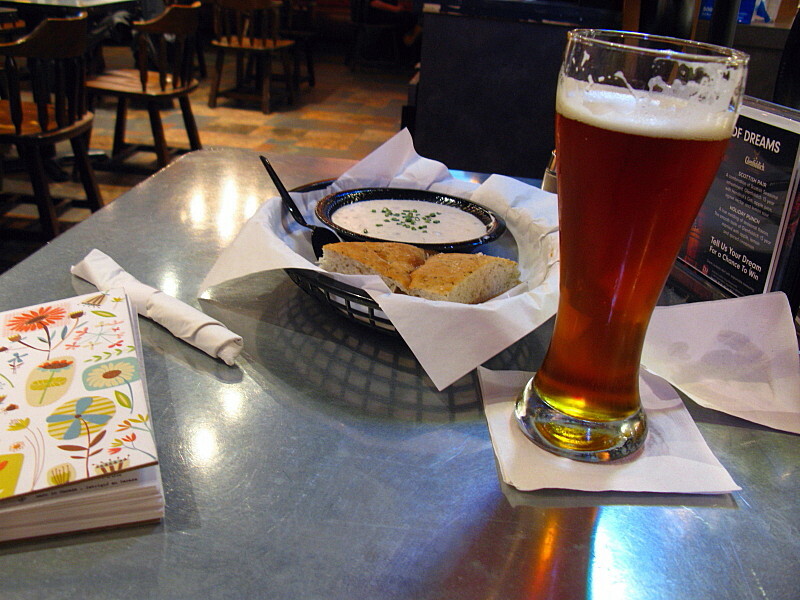 ...and after eating this early lunch with Pike IPA ... ... 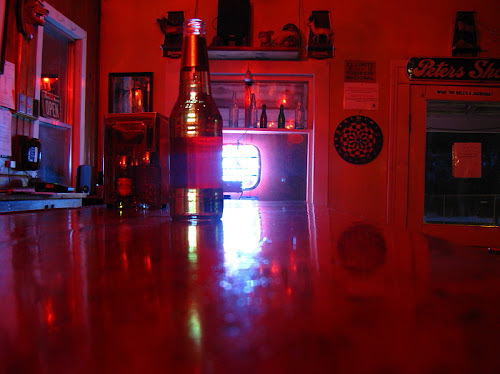 I had a fine phone forum with Dana Hunter of En Tequila Es Verdad fame (True Fame, really) — and we decided that we would definitely meet sometime in the future. With this belated post, I'm returning to our last trip north, which was now more than a month ago. At first I thought I'd do this in the spirit of Evelyn Mervine's geology picture a day — but these are not all geology photos, and I'm going to bunch 12 together, hoping that will hold me until I can get around to another continuation, whenever that will be. 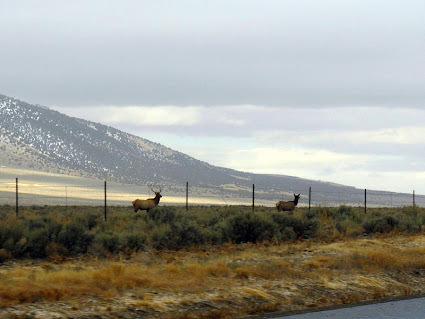 Our November trip north began here, with some wintry views and with us leaving the Great Basin for the Snake River drainage, and continued here, as we drove by an intrusive contact and then north into Idaho. The 3 Creek Road begins in the tiny burb of Rogerson, which sits along Highway 93 between the Nevada-Idaho stateline and Twin Falls, ID. From Rogerson, the road rambles west toward Salmon Falls Dam and points beyond (MSRMaps location). 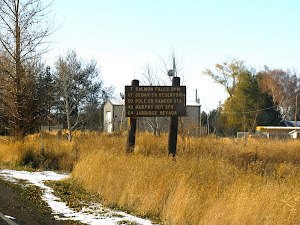 The sign at the beginning of the 3 Creek Road says Salmon Falls Dam 7, Murphy Hot Springs 49, and Jarbidge, Nevada, 64. Possibly you can guess our destination. Here, not long into our side trip (the side trip being the main point of the entire trip), we are driving over the old, one-lane Salmon Falls Dam. At this point, the 3 Creek Road still shows signs of the earlier snowstorm: a bit of snow on the sides of the road, and ice in shadowy curves. 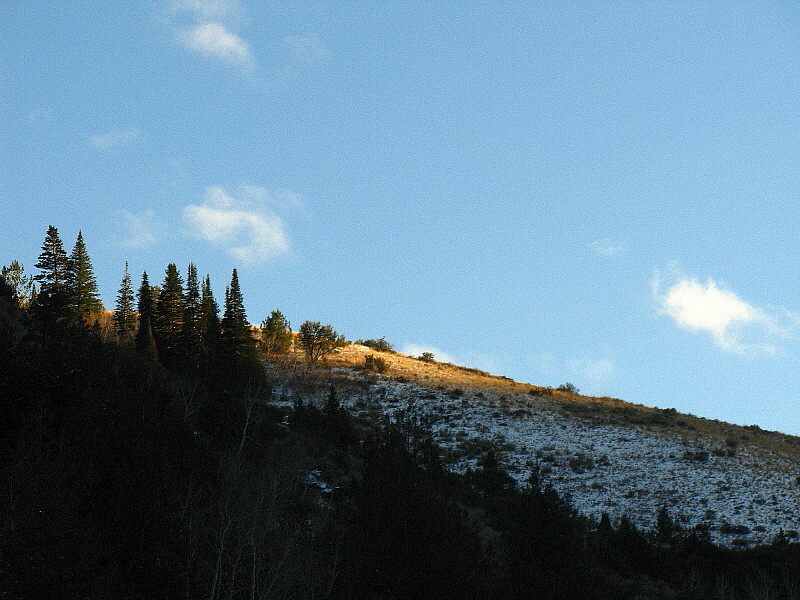 The Jarbidge Mountains sit in shadow in the not-so-far distance. The 3 Creek Road crosses miles of plains consisting of fairly flat plateaus and rolling hills, all variably incised by creeks and rivers draining northward to the Snake River. A snowy but inviting road traversing the hills to the north catches my eye. If driven, would it take us all the way to the Snake River? 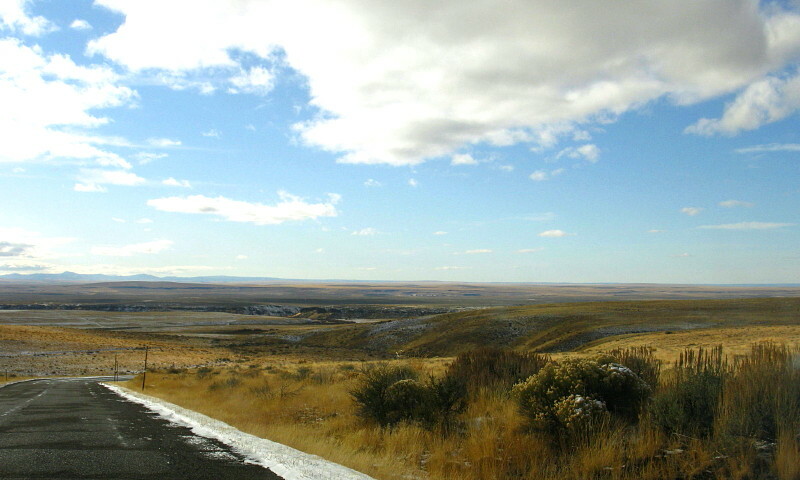 This is a typical view of the southern part of the Snake River Plain, looking west from the 3 Creek Road where it is about to descend into one of the intervening valleys. 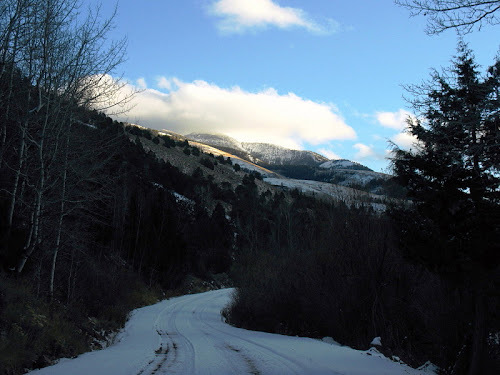 We finally left the 3 Creek Road, dropped into the gorge of the East Fork of the Jarbidge River, came to The Jarbidge Forks, and drove south into Nevada along the main fork of the Jarbidge River. 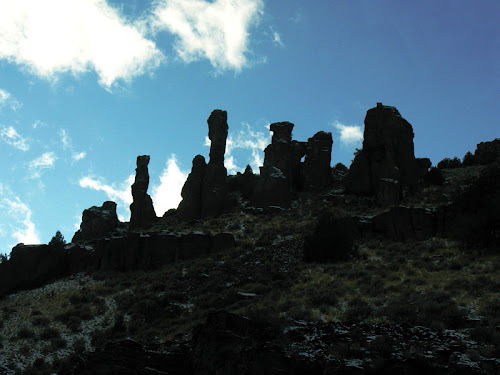 Hoodoos in the rhyolitic Cougar Point Tuff appear near the Idaho-Nevada state line. Most of the hoodoos are in Nevada, certainly the best ones are! 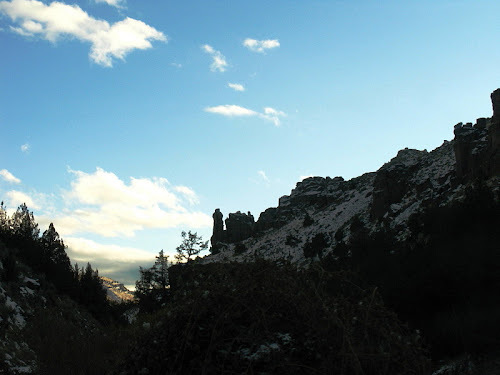 A bush or small tree grows atop a double hoodoo. 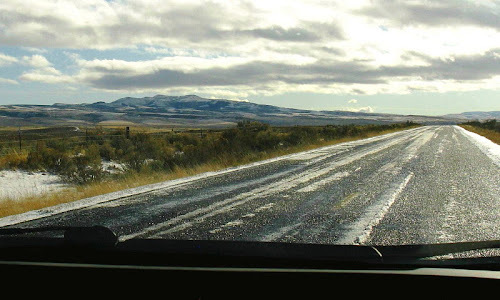 The snowy road curves ever onward, giving us glimpses of the canyon walls and mountains above Jarbidge. Sun glows on the hills we hiked in the summer of 2010, on stands of subalpine fir, limber pine, and whitebark pine. 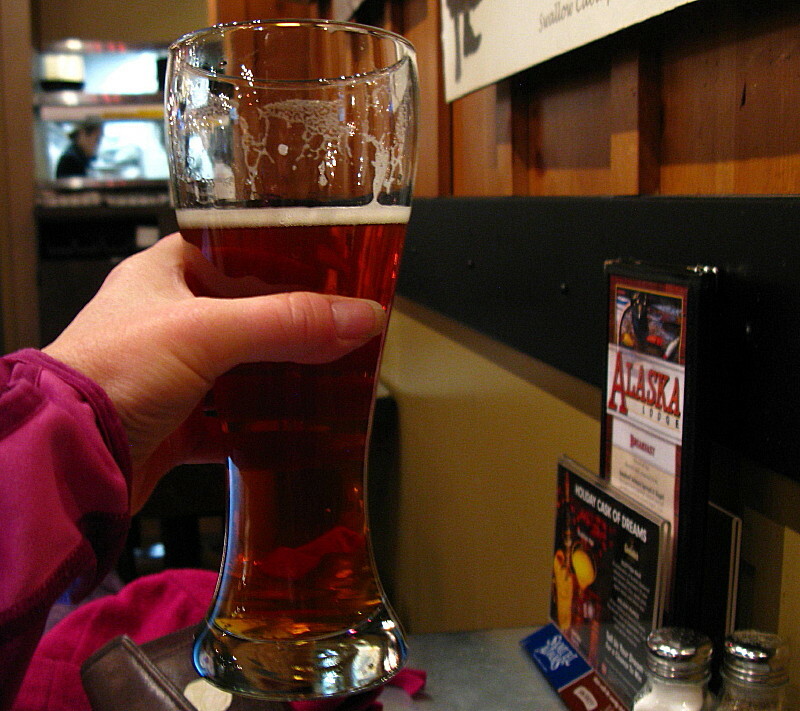 We arrive, get a room in the middle of a locally critical football game, go for a walk through the snow, and end up at the Red Dog Saloon for beers and burgers. 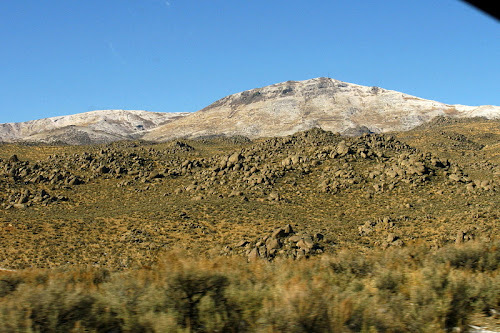 We continued on toward the small bordertown of Jackpot, Nevada, having passed out of the Great Basin by dropping into the drainage of Willow Creek – which joins with Dry Creek, which joins Jakes Creek, which enters Salmon Falls Creek near the railroad siding of Henry. 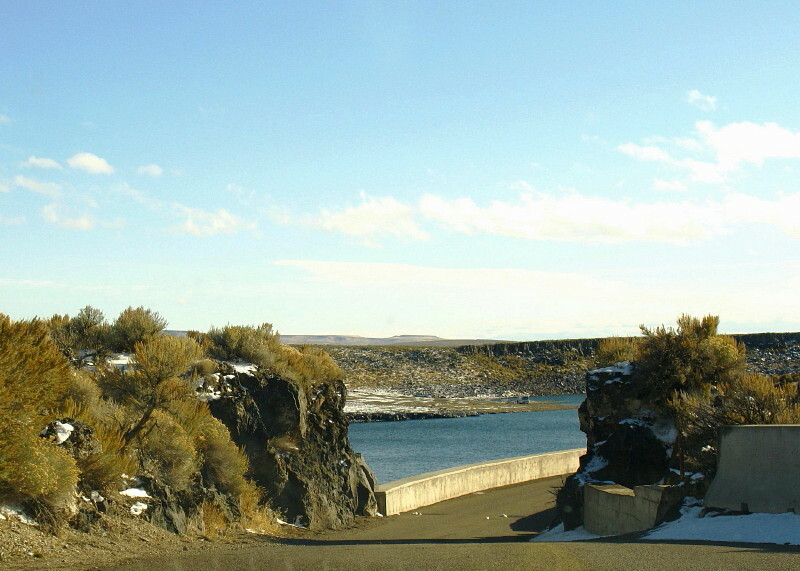 Salmon Falls Creek then flows north, eventually emptying into the Snake River below Twin Falls. Skies were clearing somewhat, and snow was no longer thretening. A few miles south of Henry, China Mountain rises into view east of Highway 93. China Mountain is a good place to see an intrusive-sedimentary contact at 70 mph. 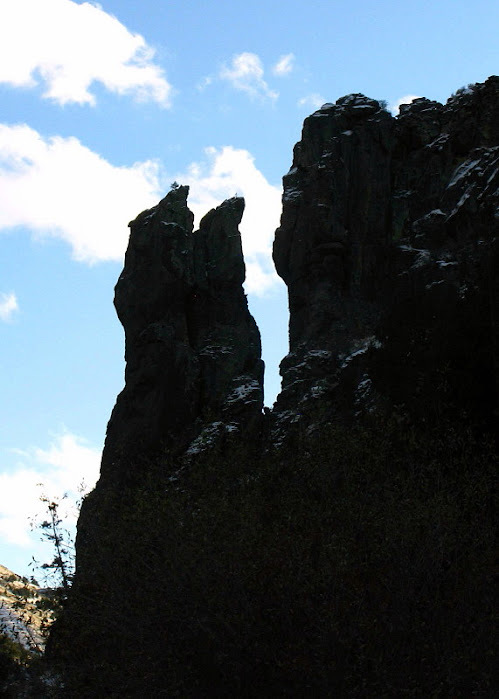 The generally rubbly or knobby looking rocks on the far north side of China Mountain are outcrops of the granodiorite of the Jurassic Contact pluton. It’s intruding late Paleozoic limestone and marble (and possibly other associated sediments and metasediments): the layered and moderately dipping beds across most of the mountain. Here I’ve drawn the approximate contact in hot pink. Granodiorite is to the left (Jgd on this map); limestone and marble are to the right (PMl on the same map). Where I’ve ended the contact, it dives under undivided Miocene to possibly Pliocene tuff, ash, and sediments (mapped as Ts3). The granodiorite of the Contact pluton shows some spectacular spheroidal weathering between Henry and the small outpost of Contact. 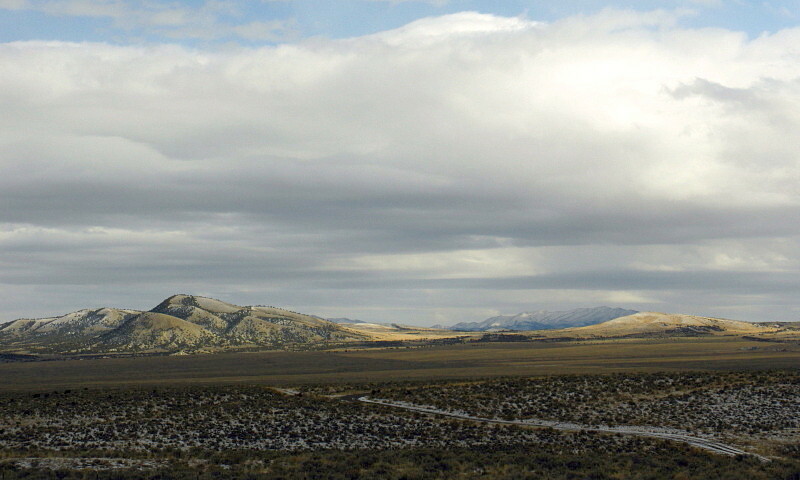 This view to the west of the highway, taken just a couple minutes beyond that last photo, shows the granodiorite in the foreground, with Ellen D Mountain in the background. Ellen D is underlain by the same late Paleozoic sediments seen on China Mountain; the contact between the granodiorite and the sediments runs behind the wonderfully knobby mass of granodiorite and the base of Ellen D Mountain. What isn’t clear from the highway, is that the intrusive contact passes eastward from the present site of Contact, runs west toward Ellen D Mountain, then curves southward. 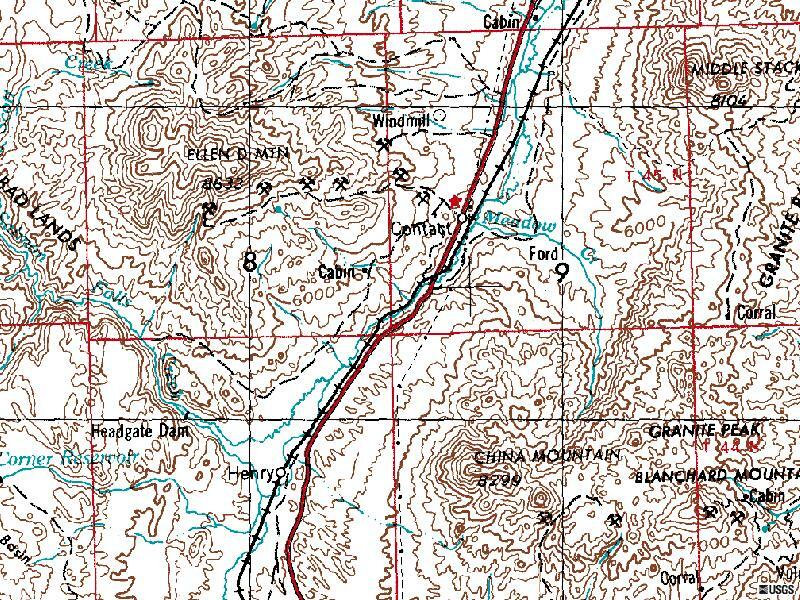 All along that contact, the topo map of the area (from MSRMaps) shows a series of old mines and prospects dug into mineralized, contact-metamorphosed rocks right along the contact. These are some of the mines and prospects of the Contact mining district, which were prospected originally for gold, but have been mined mostly for copper. 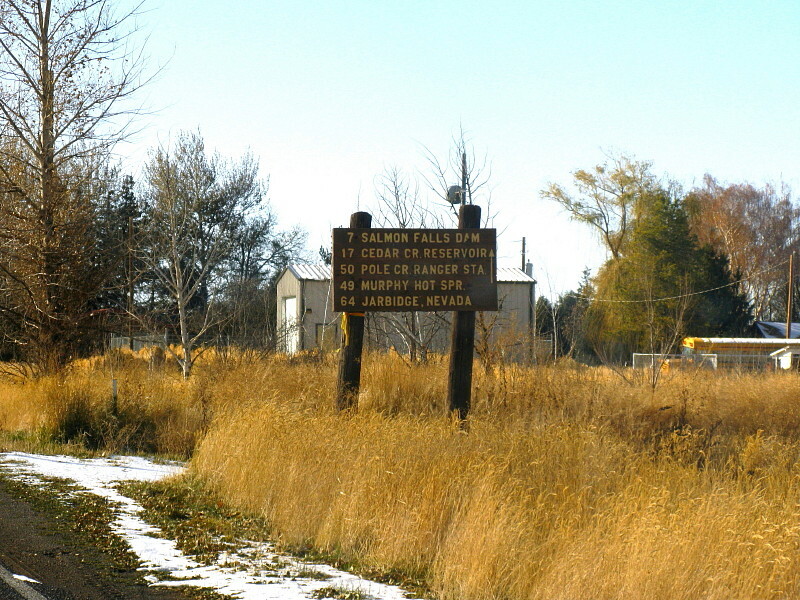 The original mining town of Contact was moved from its original site fairly early on prior to being relocated a second time at its present location. 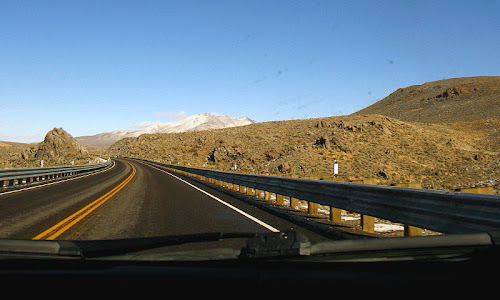 While we drive by Ellen D Mountain, the highway passes through some roadcuts in the Contact pluton. The knobby knob on the left and the low mass on the right are in granodiorite. The reddish brown hill to the far right is in Tts: rhyolitic ash-flow tuffs probably about 10 to 12 million years old, possibly erupted from the Bruneau-Jarbidge eruptive center to the west. 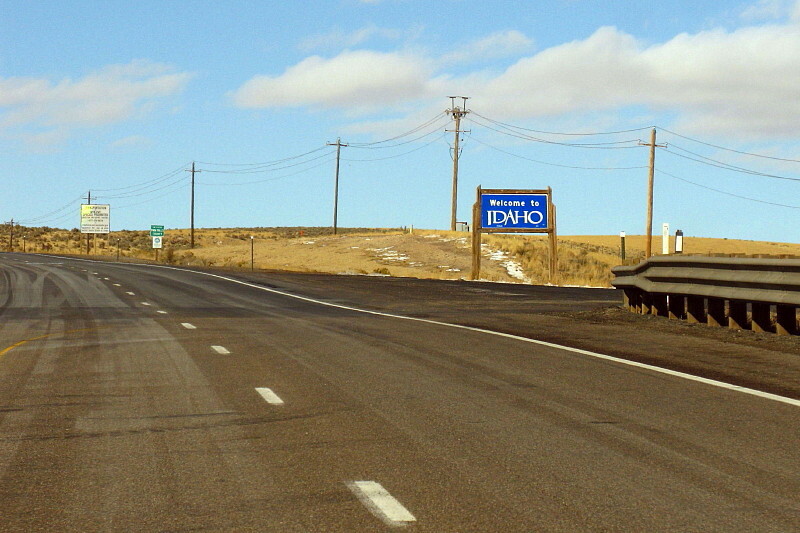 After stopping briefly in Jackpot, to gas up and grab a snack, we crossed the Idaho line at 1:20 pm PDT, 2:20 Mountain Time. Jackpot is not the only town in Nevada that operates on Mountain Time. Oh, by the way, here's my take on the naming of the various contacts. First, the Jurassic granodiorite intruded the Paleozoic limestone. Later, uplift exposed the contact between the Jurassic and Paleozoic rock formations. 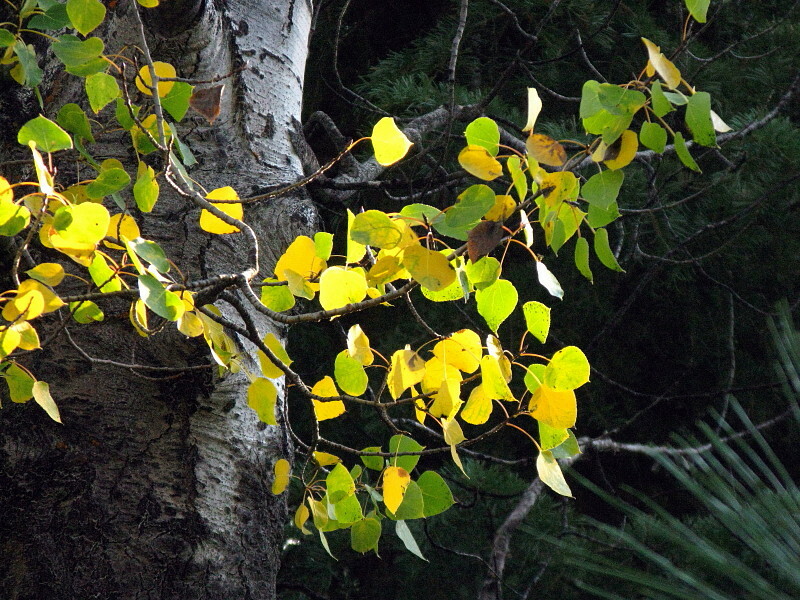 Much later, people came along prospecting for gold and copper; they were attracted to the contact for various reasons, not the least of which was probably some nice float of copper oxides and copper carbonates. When they staked claims, they listed the claims as being in the Contact mining district, which they named after the mineralized contact they were so hot on. They set up a town and called it Contact, after the mineralized contact and the mining district. Eventually, all the nearby mining districts in the area were consolidated into one district called Contact. The order of the naming and founding of the latter two (Contact the mining district and Contact the town) is entirely speculative on my part. 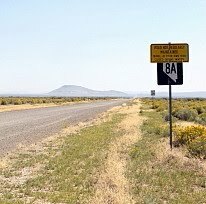 I have a bit more information on this part of Highway 93, from south of Wells to the stateline, in an earlier post, here. Sheet 3 of the above, covering our area of interest in the upper left. 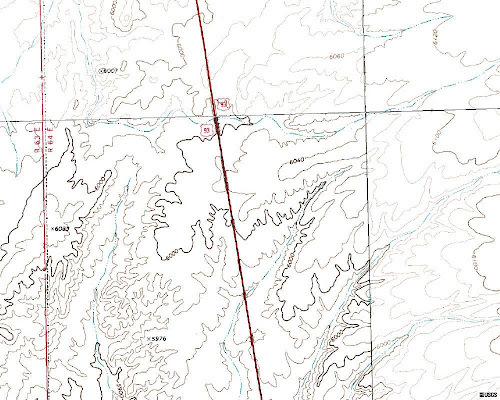 Sheet 6 of the above, the explanation for the entire map. 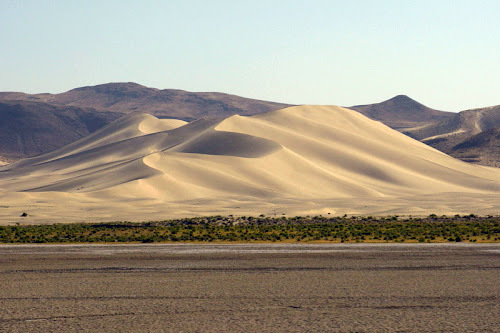 Two dune posts in a row in a row creates a geoblogosphere meme, and Sand Dune Week has been proclaimed! Sand Mountain — located on Highway 50 about 25 miles east of Fallon, NV — is a perfect candidate for Dune Week, being one of those booming or singing dunes described here on Cocktail Party Physics. View angle, time of year and day (sun angle), and weather all affect the seemingly shifting appearance of Sand Mountain, sometimes dramatically. The first photo (above)was taken from the west-southwest during the middle of an early March day last spring, 2011. 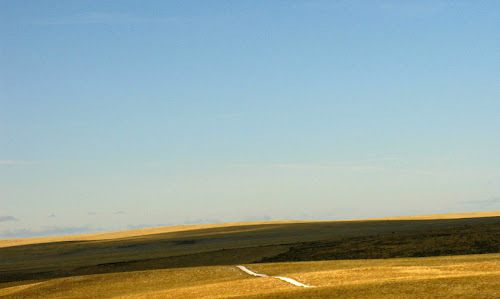 This second photo was taken from the south in the late afternoon in late May, also 2011. Enlargement of the second photo will reveal a barely visible white line on the east side of the dune: the RV city usually sitting in the lee of the dune, where ATVers gather to run up and and down the face. 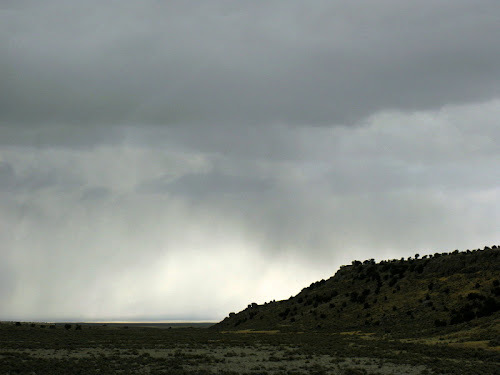 Here's the mountain in a wind storm, a late afternoon in mid-May of 2009. Any RVs present are getting sand blasted! 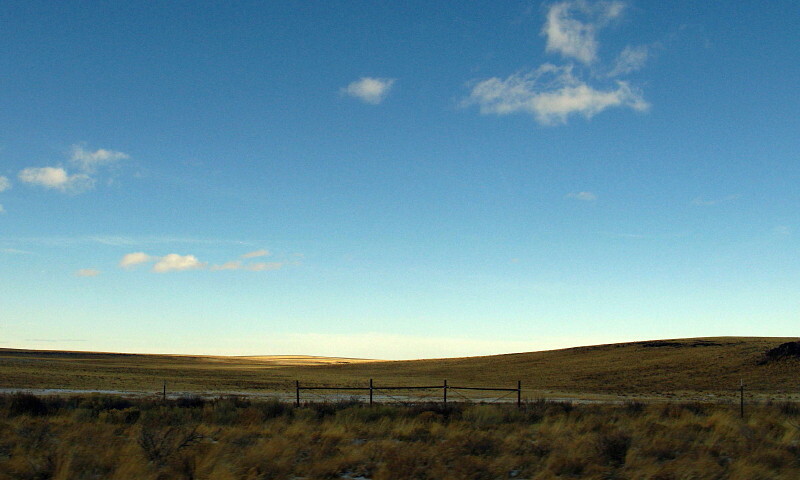 Lighting for pictures can be quite variable, and I often get flat pictures just driving by at random times of the day. But even mid-summer can be good for shadows and details, as shown by this photo taken early one morning in early July, 2010. 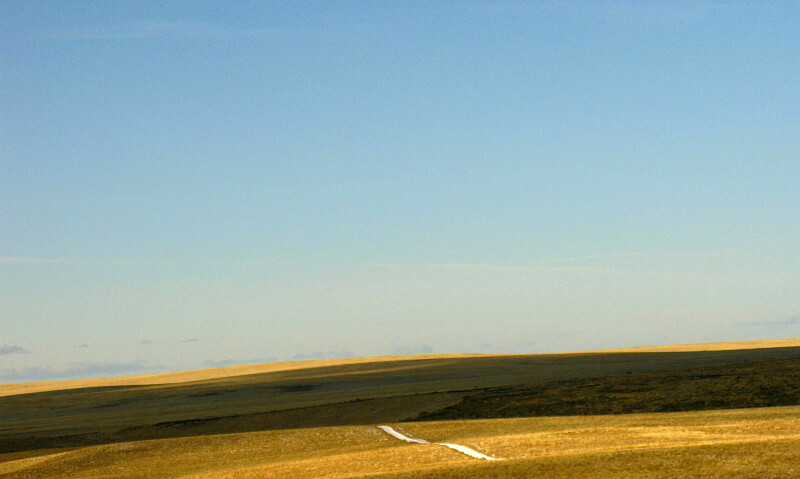 Enlargement of this photo shows two tiny-looking ATVs on the west side (far left) of the dune, behind and a little to the right of a foreground dark spot that is possibly a rock or large bush. Look carefully! 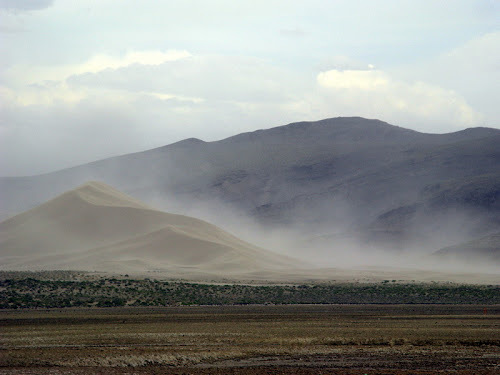 Although I've driven up to the RV city and to the half buried Sand Springs Pony Express station, I've never gone on the dune to try to make it boom. 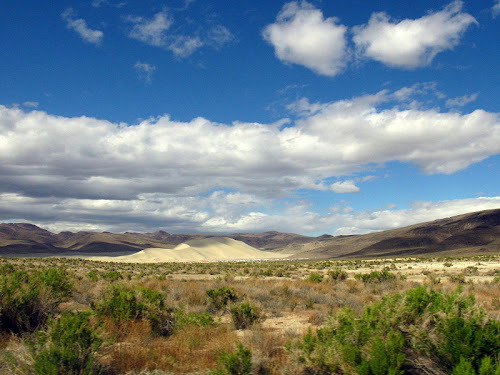 One thing that can be done fairly easily, as part of this mini virtual field trip, is to follow the sand from Sand Mountain back to its original source, back to the southwest across a mountain or two, then across Highway 95 south of Fallon, southwest toward the delta of the Walker River, where the river emptied into ancient Lake Lahontan. Start with this map and this air photo, then go here (scale change), then here, and then here (direction change). The last air photo is mostly below the high stand of Lake Lahontan, but shows the final current destination of the Walker River: Walker Lake. La Pointe, D.D., 2000, Earth Science Week 2000: Geology along America's Loneliest Highway. 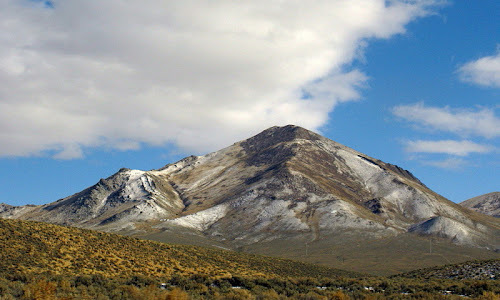 A field trip for families and rockhounds: Nevada Bureau of Mines and Geology Educational Series E-37. Trexler, D.T., and Melhorn, W.N., 1986, Singing and Booming Sand Dunes of California and Nevada: California Geology, v. 39, no. 7, p. 147-152. Also reprinted here on Tom Sweich's webpages. NOTE: The California Geology search page is quite finicky or counterintuitive. I finally searched using only the year, 1986. What also worked was %California% %Nevada% with the percent symbols, entered as keywords under "Title of Article." I really like my A650 IS, I have had it cleaned or fixed once (dust or spots internally on the lens or mirror, a glitch that somehow develops during airline flights). It's a great camera that has already survived one E18 or "Lens error, restart camera" event, which I fixed by carefully whacking the camera, as per the percussion advice on some forum (maybe this one; other options were send in for repair or take the camera apart and mess around). I'm now facing a growing spot of no pixels on the vari-angle LCD screen (vari-angle is a higher requirement for me than AA batts). I'm sure Canon can fix this, but I don't know at what cost (yet). In the meantime, before I send my camera off, I'll need another camera (though I could pull out my old A620, like I did in the spring of 2010 when I last had the A650 in for repair). eBay currently has A650's that generally sound no better than the one I already have. A note: Xmas always comes early when I buy something like this for myself. UPDATE 28Jan2012: Just ordered a Canon G12. This option retains the vari-angle LCD screen, adds slight weight and height, aperture drops from max 4.8 to 4.5, total zoom drops from about 210 mm to 140 mm, wide angle increases from about 35 mm to 28mm, megapixels drop from 12 to 10, have to use Canon battery packs, gain High Dynamic Range shooting. ...eventually heading directly into the fast-moving storm that was just clipping the northeast part of the state, not leaving a lot of snow in it's wake, but blowing like crazy. 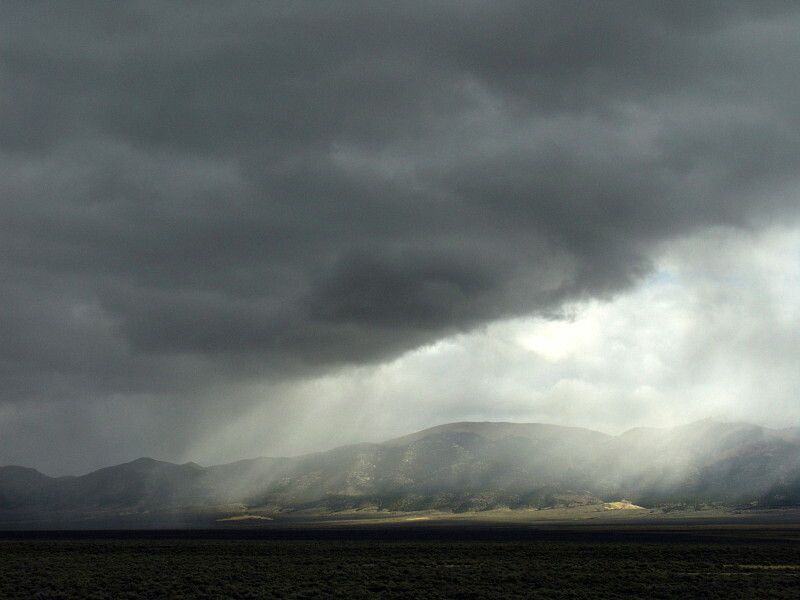 Light and dark patches northeast of Highway 93: the storm moves across Clover Valley south of Wells, Nevada. Sunlight comes through light snow showers on the west side of Spruce Mountain Ridge, a narrow basin-and-range ridge east of the East Humboldt Range. 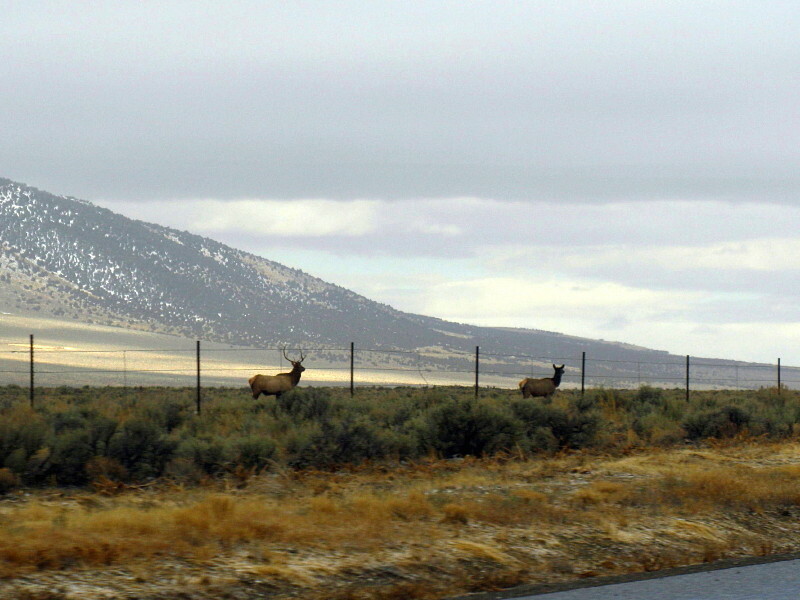 Still south of Wells, somewhwere near the turnoff to Ruby Mountain Brewery, we drove by a small herd of elk grazing on the other side of the right-of-way fence. 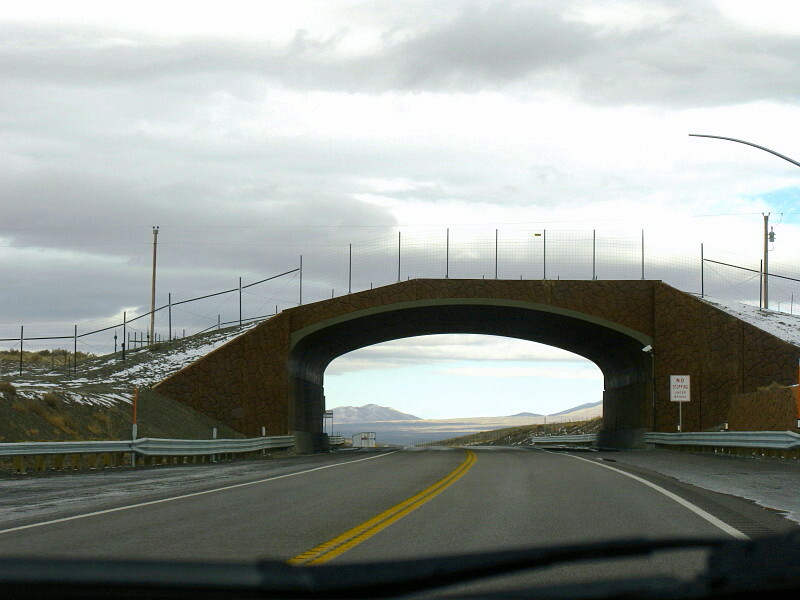 Over the last couple years, NDOT has installed a couple wildlife overpasses between Wells and Jackpot. 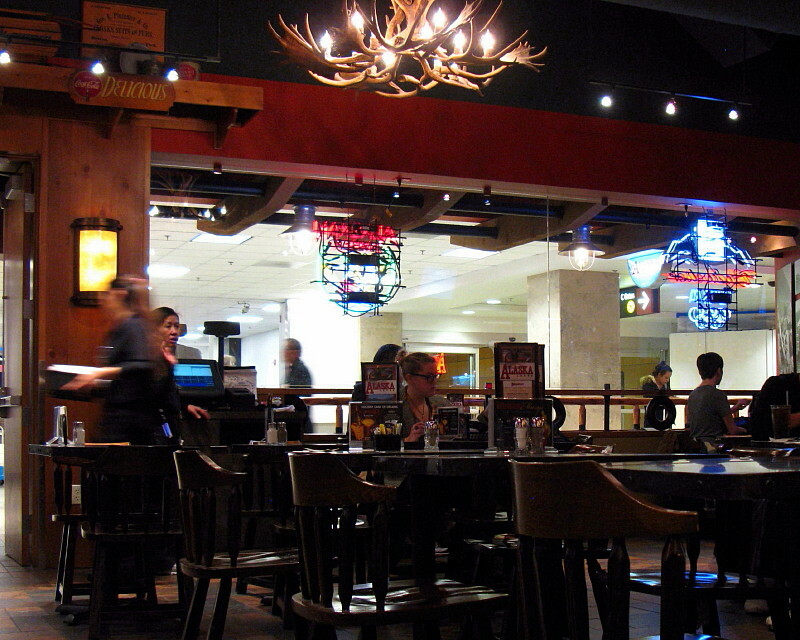 This is the one at HD Summit (MSRMaps location). 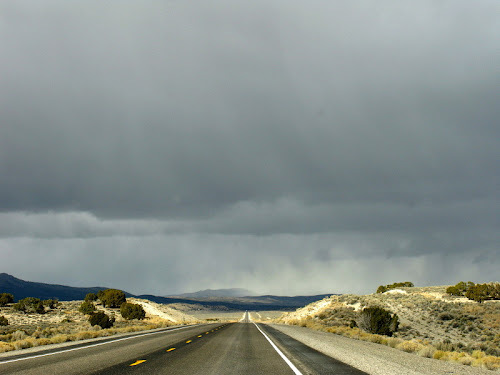 At this point, Highway 93 is still inside the Great Basin, within the watershed of miles-long Thousand Springs Creek, which eventually leaves Nevada for Utah and the Great Salt Lake Desert northeast of the small town of Montello. 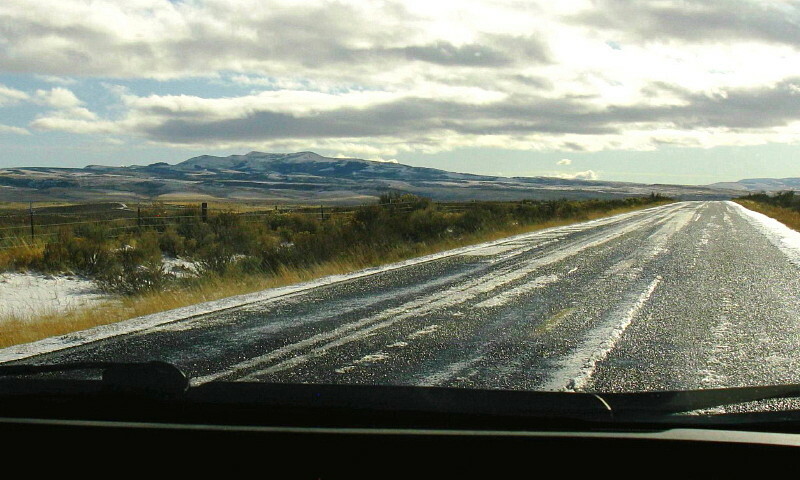 About 10 miles north of HD Summit, Highway 93 enters the drainage of the Snake River after crossing an unimpressive drainage divide atop a small set of east-west hills, south of the "93" on the MSRMaps image below, and here looking north on Google Street View. I couldn't quite locate this major drainage divide while we were driving south, but instead probably thought it was in the small hills just north of the "93" on the MSRMaps view. 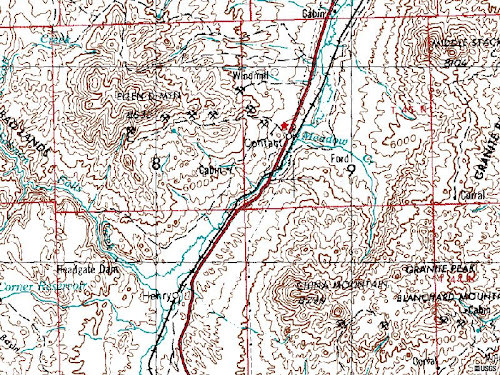 MSRMaps image courtesy of the USGS. 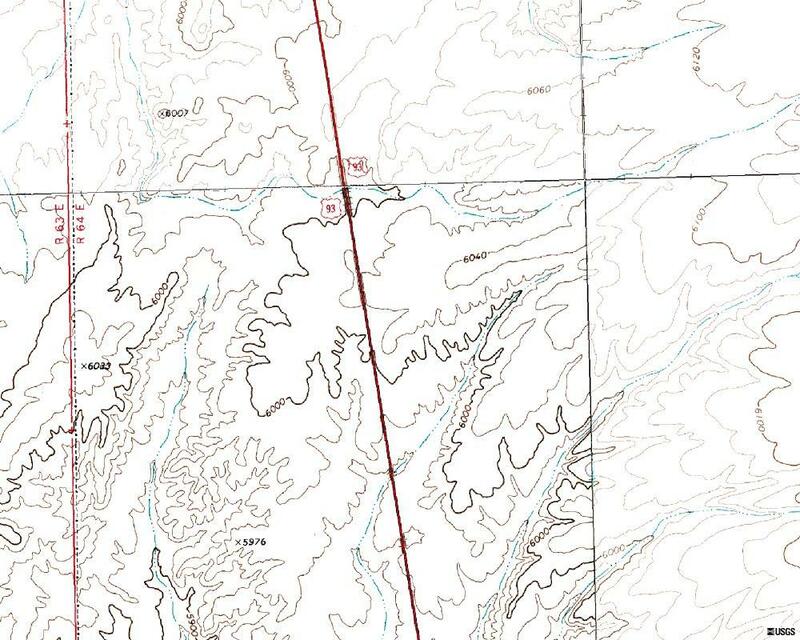 One mile is shown by the black section line running east-west between the red, north-south township border to the left of Highway 93 and the black, north-south line to the right of Highway 93. 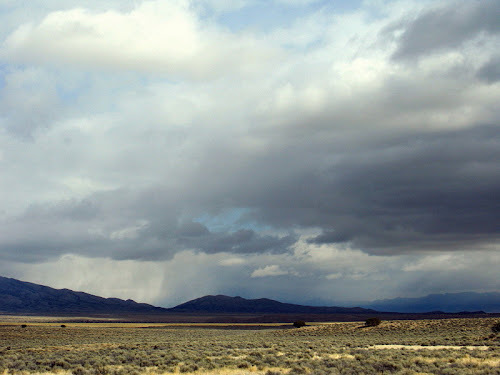 At this seemingly insignificant drainage divide, the internally draining Great Basin ends. 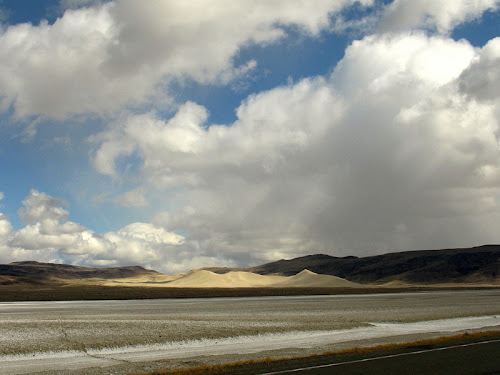 The Basin and Range Province, which overlaps the smaller Great Basin, continues a ways to the north, merging gradually with the plateau country on the southern edge of the Snake River Plain. 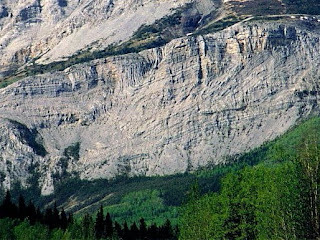 My two posts on Folded Mountain are perpetually popular, at least from searches, so I've put together this mini-series of roadside geology along the Alcan, or Alaska Highway, or Highway 97 (British Columbia). If I knew more about the geology along that road, I might post more of my photos from my several trips. And I mean just a bit of color! 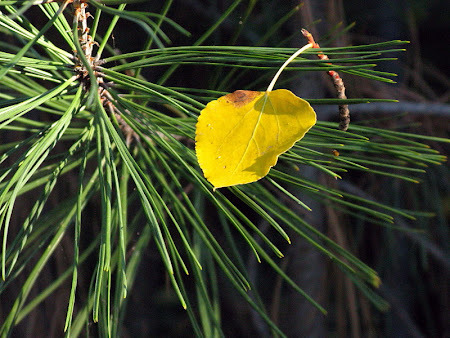 On our last trip to the lake about mid-month, the leaves on our aspens had started turning, but they hadn't really gotten all that far. In fact, they were not quite as far along as they were at a similar time three years prior, so possibly this is fairly normal (I'd have to go deeper than the archives held in this blog or on my computer and pull out some backup drives to find out). 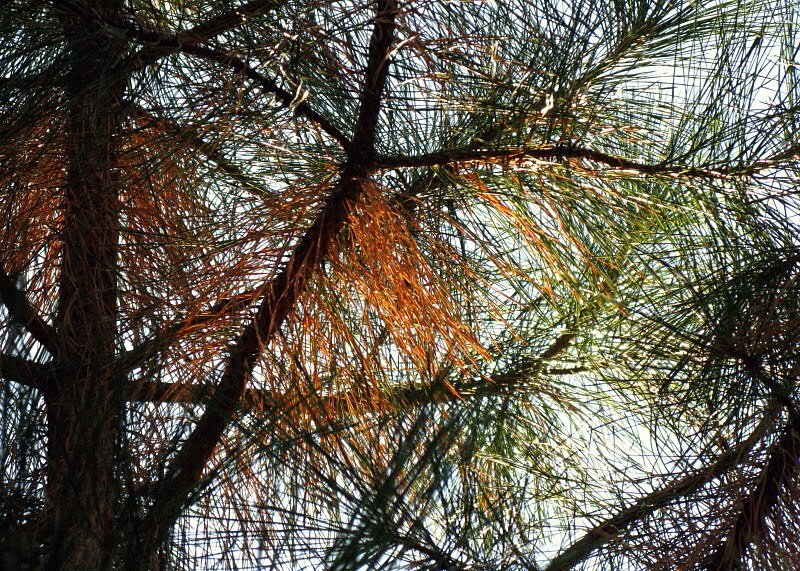 While at the lake, we noticed that the pine trees all around had a lot of brown needles, maybe not more than average but it seemed like a lot: many Ponderosa pines had what looked like about 25 to 50 percent brown needles. 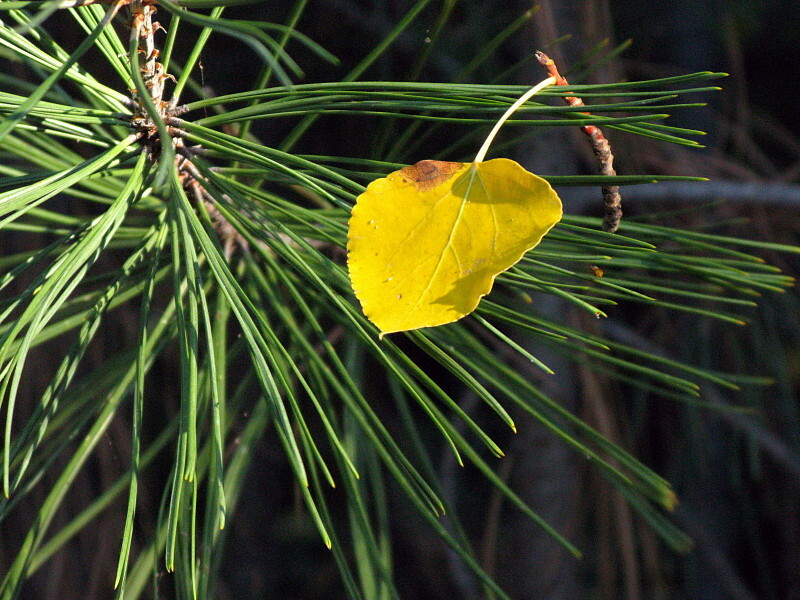 They usually retain needles for three to four years, which would be an average drop rate of about 25 to 35 percent. 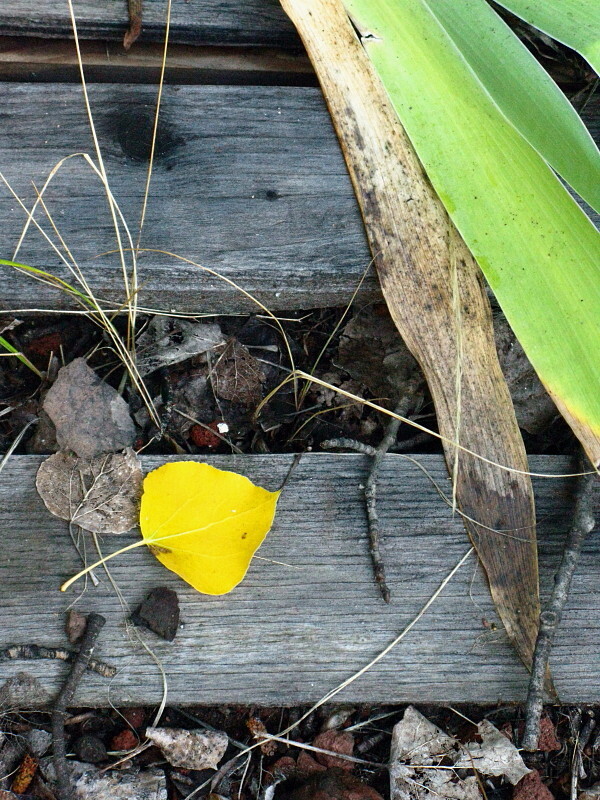 I spent some time walking around the yard, photographing things that caught my eye. Okay, enough of that. 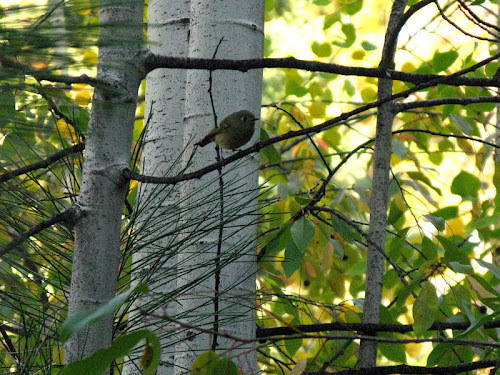 Back in the thick aspens where they are intergrown with alder and fir, lots of tiny little greenish yellow birds hopped about and flew here and there, barely stopping long enough for me to get a picture. But I did! 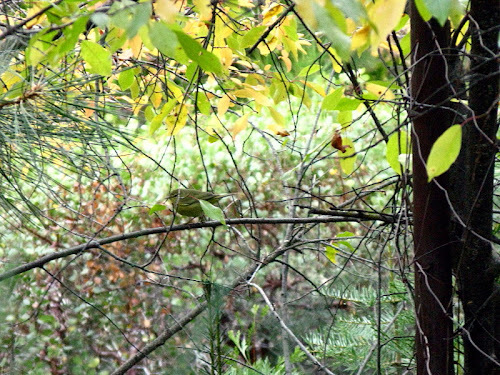 Two sharp pictures, as a matter of fact, out of all the hundreds (it seemed) of missed birds, blurry birds, and bird butts. 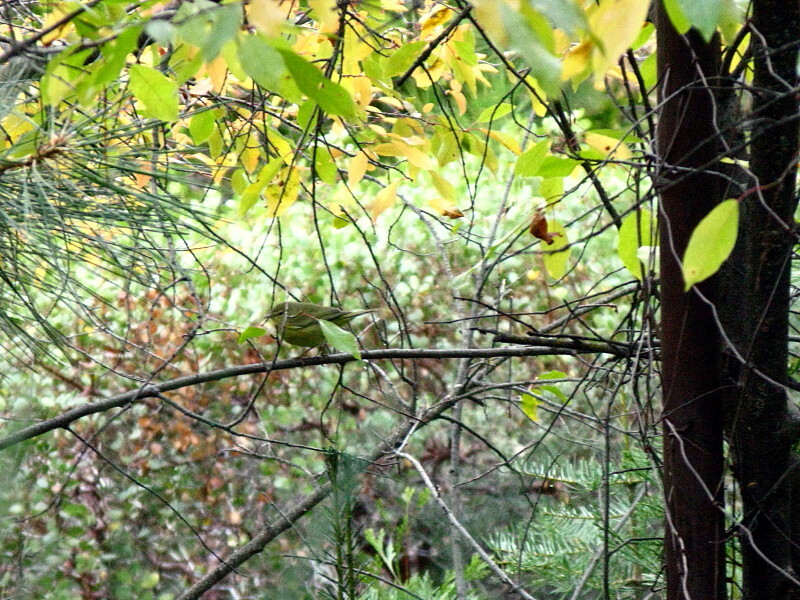 Not sure what they are, however, other than some kind of sparrow. 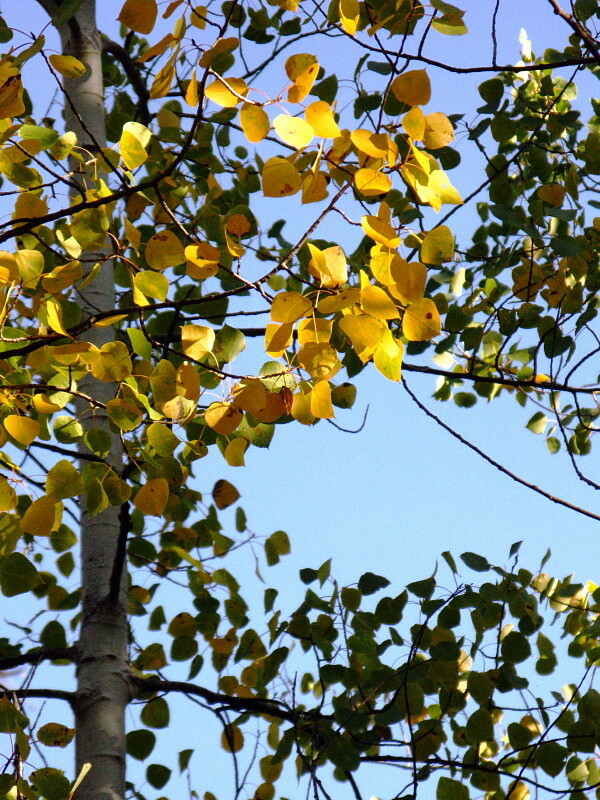 They are very small, they hardly ever stop moving, and they love all shady and hidden areas. We were busy at the lake, as were are at times, and one thing we did was to turn off water to our flowers. This year, we had lots of daisies, a few purple cone flowers, and very few gaillardias. 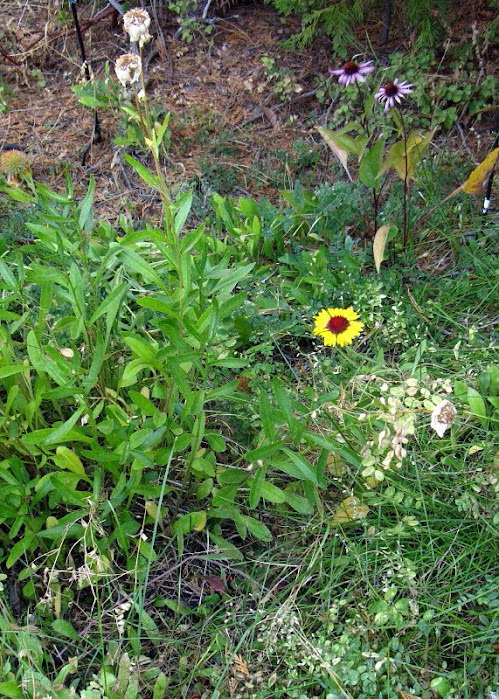 We don't know if the gaillardias were getting too much water, were choked out by the vetch that we didn't weed, or if the daisies are providing a negative influence. If the latter, we may weed some daisies next year. Can't have a monoculture. Other successful undertakings mainly centered around prepping the torn up dining area, acquiring a 12x12 sheet of rock-pattern vinyl flooring, and carefully cutting and dry-laying it. Next year, or sometime in the winter, we will install some matching baseboard trim. 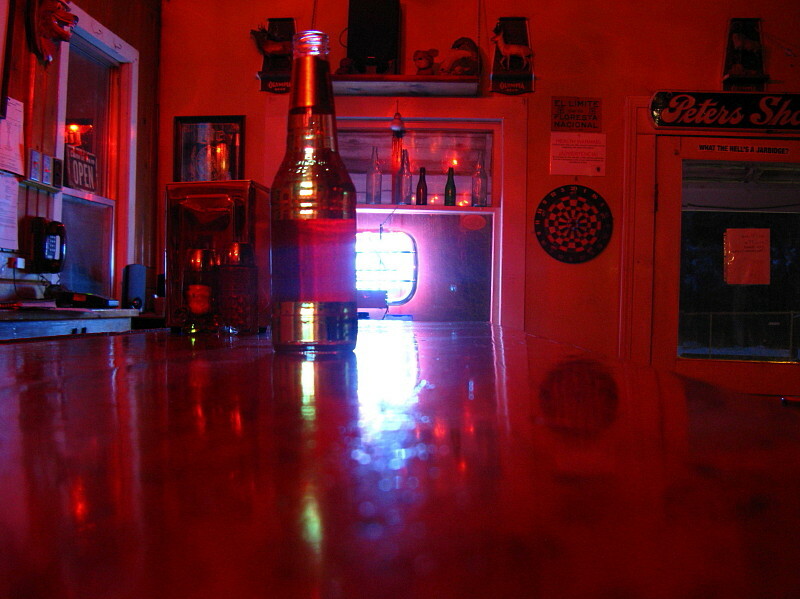 Needless to say, other projects remain, some started, some merely thought about. I'm actually hoping to get to one or two of these this winter! We'll see, though. It gets cold, the place gets snowed in, the water will be turned off, and just getting there can seem like a major accomplishment.